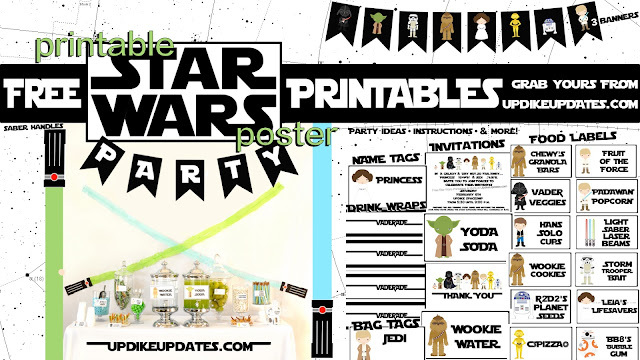 Right here in this post you will find ideas, pictures, free tutorials and printables to make your party a memorable & adorable one! I thought I'd do a post similar to something I was hoping I'd find while preparing this last minute Star Wars party for our two littles in two days. I had no idea what I was venturing into... but nothing I found was light colored or the look I was going for. So I made my own and figured someone else may be in the same boat wondering if it was possible to have a Star Wars theme and a cute party not be mutually exclusive. Granted the party took place at night so the party photos don't really do the "fun-ness" justice but you'll get the idea and this post will hopefully be a launch pad for your own ideas! These were the invites to our shin-dig but there are two printable invitation options for your printing pleasure down below. Entertainment was purely that! We had a special visit from Star Wars Characters! Rey taught all our young ones Jedi training and they all got to test their new skills with their dollar store light sabers on Kylo Ren! Our friends Ian and Christina Jensen's costumes & acting were AMAZING! The other games they played involved two sets of teams using two noodle light sabers each (from Target) and getting whiffle balls across the lawn. Whoever got most won! They loved this one. Another game played (in addition to the impromptu light saber battles throughout the party:) was the classic Darth Vader piñata which I also got at Target. 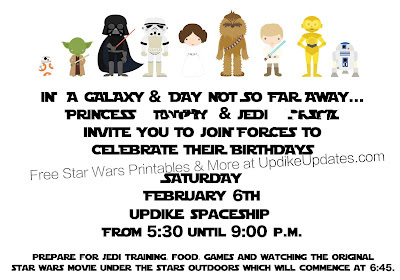 The main event was watching Star Wars on the big screen outdoors with all the fun fixings to munch on that they each put in their white paper bags to take outside and then home with them. This party was an absolute blast to plan and even more fun to watch the kiddos enjoy! As always, this is not a sponsored post but I wanted to throw out a special thanks to AZCookieCorner for the adorably delicious cookies and SurpriseCakes for making this scrumptiously delectable one! Could NOT believe they were able to do this with such short notice. These ladies are BEYOND CREATIVE and TALENTED. 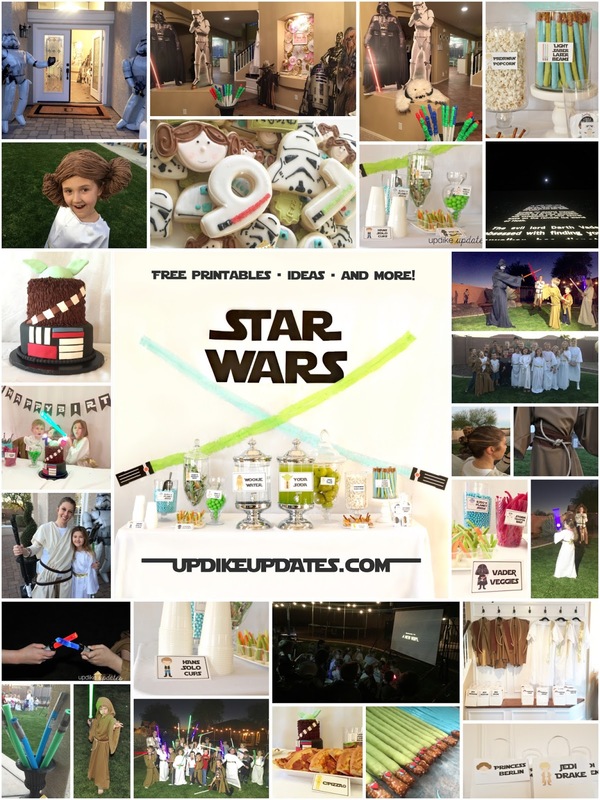 Click the image below to enlarge our party's pictures and get some ideas for your own! 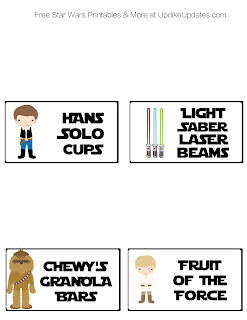 Here's a preview of what your printables will look like! CLICK WORDS OF WHAT YOU'D LIKE TO PRINT BELOW! 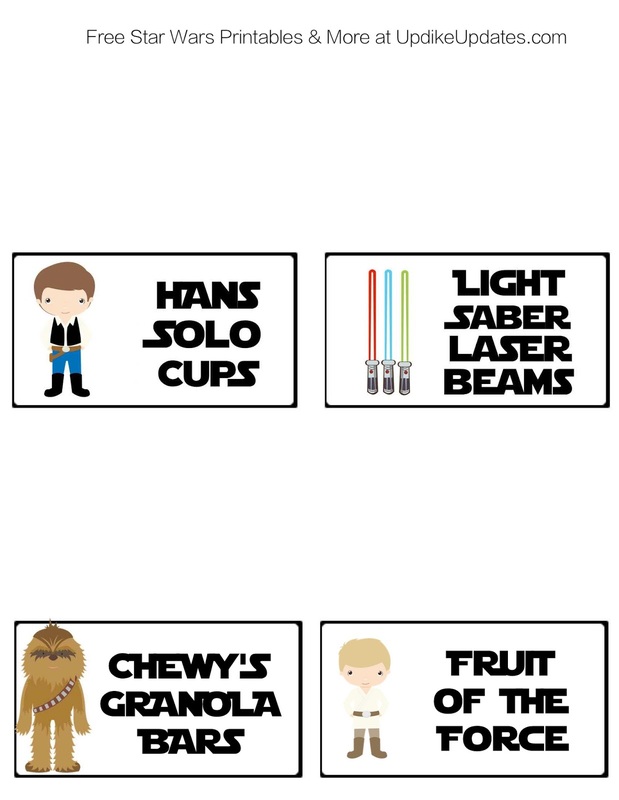 Here is the downloadable STAR WARS font that I used. THESE ARE FOR PRIVATE USE ONLY. 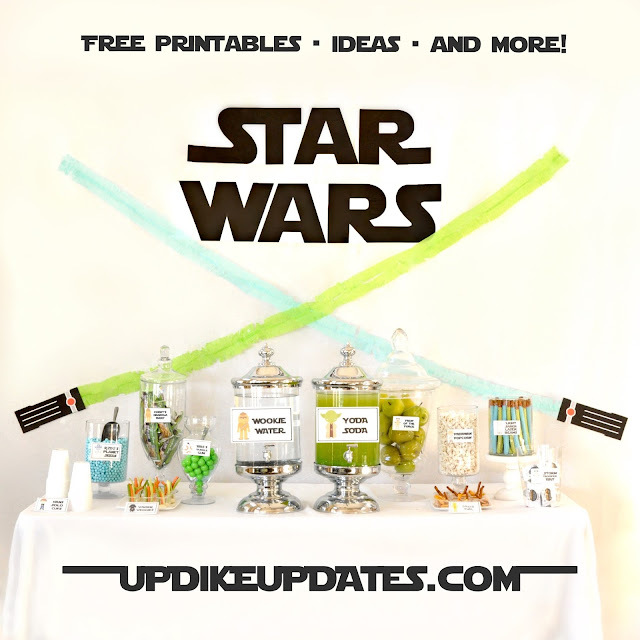 Please feel free to share and direct people to updikeupdates.com to print their own! Disclaimer: I am in no way affiliated with Star Wars or Disney and these are just artist's renditions of the characters put onto printables that I have created and am now SHARING WITH YOU! The character's pictures I purchased for private and commercial use from ClipArtopia and LightBreezeBoutique. Click on their names to view their cute shops! FUN DECOR TIP! To make what I used for the backdrop I just taped two strips of streamers together to make them wider and then folded them up so I could cut fringe more quickly along the sides. Unravel, tape up, and complete them with the printable handles below to finish your light sabers! BELOW YOU WILL FIND TUTORIALS TO MAKE THE EASIEST, QUICKEST AND CHEAPEST COSTUMES FOR YOUR LITTLEST JEDI'S! 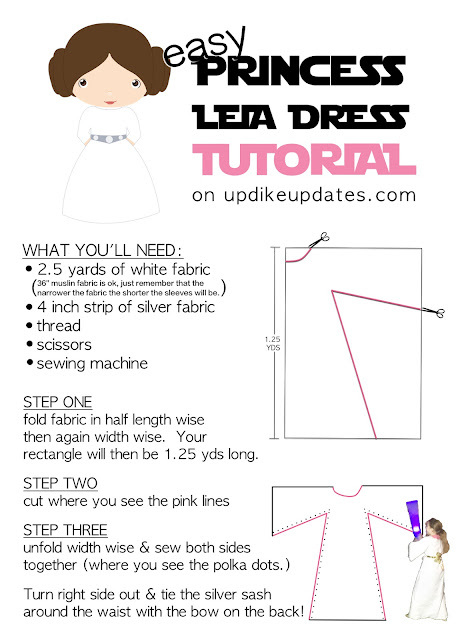 PLEASE COMMENT BELOW IF YOU FOUND THIS POST HELPFUL! I love getting feedback and it's nice knowing this was time well spent putting this together if it meant it helped you! THANKS FRIENDS!